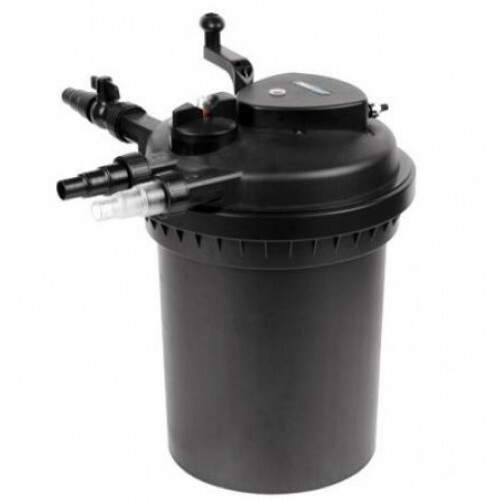 The PondMAX Pressure Filter high efficiency pressurized pond filter system with integrated UV-C uses a new UV technology and has a user-friendly design. These units create crystal clear water that can keep a pond or water feature suspended-algae free for years (If Sized Right). The PondMAX Pressure Filter with an integrated UV provides a smart and efficient solution for a new or existing water feature. The PondMAX Pressure Filter features an easy-to-use backwash system that is able to clean the foam pads inside the filter without having to open up the entire system. The filter cleaning process can be taken care of within a few minutes and the aquarist does not have to deal the hassle of taking the filter apart or removing the filter pads. This feature rich filter ensures that the internal filters perform at optimal levels for many days and prolongs the time between full maintenance sessions. An “easy-view” cleaning indicator signals when it is time to perform backwash cleaning. For ponds up to 3,600 gallons without fish and 1800 gallons with fish. Inlet, Outlet, and Ball Valve backwash connection are stepped to accept 3/4",1", 1-1/4", & 1-1/2" inch tubing-Always use as large as possible tubing size so to reduce friction and head-pressure loss.